Molten Salt Reactors (MSRs) are nuclear reactors that use a fluid fuel in the form of very hot fluoride or chloride salt instead of the solid fuel used in most reactors. Since the fuel salt is liquid, it can be both the fuel (producing the heat) and the coolant (transporting the heat to the power plant). There are many different types of MSRs, but the most talked about one is definitely the Liquid Fluoride Thorium Reactor (LFTR). This MSR has Thorium and Uranium dissolved in a fluoride salt and can get planet-scale amounts of energy out of our natural resources of Thorium minerals, much like a fast breeder can get large amounts of energy out of our Uranium minerals. There are also fast breeder fluoride MSRs that don’t use Th at all. And there are chloride salt based fast MSRs that are usually studied as nuclear waste-burners due to their extraordinary amount of very fast neutrons. The benefits of MSRs are plentiful, hence their resilience as an interesting topic throughout reactor history. We break them down by topic here. Sustainability is a measure of how efficiently a system can use natural resources. Most traditional reactors can only burn about 1% of the uranium on Earth. Many advanced reactors, including MSRs, can do much better. Here’s why MSRs are good in this regard. Online fission product removal — Since the fuel is liquid, it can be processed during operation. This means that when atoms split into the smaller atoms (fission products), those small atoms can be collected and pulled out of the core very quickly. This prevents those atoms from absorbing neutrons that would otherwise continue the chain reaction. This allows very high fuel efficiency in MSRs. Good utilization of Thorium — As mentioned above, the MSR chemical plant can continuously remove fission products and other actinides during operation. This means that when Thorium absorbs a neutron and becomes Pa-233, the Protactinium can be removed from the core and allowed to decay to U-233 in peace, without any risk of causing parasitic neutron losses. While this is not the only way to burn Thorium, it is perhaps the most elegant. No neutron losses in structure — Since there is no structure like cladding, fuel ducts, grid spacers, etc., there are no neutron losses in these. This helps fuel efficiency and therefore sustainability. Though economics are not truly known until a system is in commercial operation, there are reasons to think MSRs would have favorable low price. Online refueling — Where normal reactors have to shut down to move fuel around or put new fuel in, MSRs can do all this while at full power. You just dump in a new chunk of fuel into the vat (carefully, of course). This allows high capacity factors, improving economics. The reactors may still have to shut down to do maintenance, but they likely will have better uptimes. No fuel fabrication — Any commercial fuel fabricator will tell you that it is expensive to build fuel assemblies, fuel pellets, cladding tubes, core support structures, flow orifices, etc. MSRs are basically just vats of fuel, so they are much simpler and cheaper in this regard. High temperatures possible — Molten salts were first looked at for their ability to go to very high temperatures. At high temperatures, power cycles convert heat to electricity with much less loss, giving you more money for a given amount of heat. Additionally, many industrial processes require high-grade heat, and these reactors could be used to that while producing electricity. Best of all, MSRs can do high temperature without a pressurized coolant (as required in gas-cooled reactors). Smaller containment — Since the system pressure is low and the heat capacity is high, the containments can be smaller and thinner. Very low excess reactivity — Since they can be continually refueled, there is no need to load extra fissile material to allow the reactor to operate for a long time. This means that it is difficult to have something happen (like an earthquake) that could cause a shift in geometry that inserts reactivity and causes a power spike. Negative temperature coefficient of reactivity — In general, if the fuel heats up, it expands and becomes less reactive, keeping things stable. Note that this is not always true in graphite-moderated MSRs. Low pressure — Since the fuel and coolant are at atmospheric pressure, a leak in a tube doesn’t automatically result in the expulsion of a bunch of fuel and coolant. This is a major safety advantage that enables passive decay heat removal (preventing things like what happened at Fukushima). The salts generally have extremely high heat capacity as well, so they can absorb a lot of heat themselves. On the other hand, their thermal conductivity is about 60x worse than liquid metal sodium. No chemical reactivity with air or water — The fuel salt is generally not violently reactive with the environment. So where LWRs have hydrogen explosions and SFRs have sodium fires, MSRs do well. Of course, MSR leaks are still serious because it’s not just coolant... it’s extremely radioactive fuel. Drain tank failure mechanism — If something goes wrong in a MSR and the temperature starts going up, a freeze plug can melt, pouring the entire core into subcritical drain tanks that are intimately linked to an ultimate heat sink, keeping them cool. This is an interesting accident mitigation feature that is possible only in fluid fuel reactors. All those wonderful benefits can’t possibly come without a slew of problems. Lots of people promote these reactors without acknowledging the issues, but not us! A reactor concept has to stand on its two feet even in the face of disadvantages (and we think the MSR can do this). Let’s go through them. The primary concern with MSRs is that the radioactive fission products can get everywhere. They are not in fuel pins surrounded by cladding, but are just in a big, sealed vat. You can put a double-layer containment around it, sure, but it is still challenging to keep them all accounted for. Where some of these fission products and actinides are radioactive, others have chemical effects that can eat away at the containment. The implications of this are many. Material Degredation — with half the periodic table of the elements dissolved in salt and in contact with the containment vessel, there are lots of corrosion and related concerns. Noble metals will naturally plate out on cold metal surfaces. In a power reactor, a heat exchanger will be the coldest metal around, and so the heat transfer surfaces will need periodic replacement. At MSRE, Tellurium caused cracking of the Hastelloy-N material. This was mitigated with chemistry, but similar problems may show up in long-lived power reactors. Tritium production If lithium is used in the salt, tritium will be produced, which is radioactive and extremely mobile (since it is small, it can go through metal like a hot knife through butter). ORNL used a special sodium fluoroborate intermediate salt to capture most of it, but a large amount still escaped to the environment. Remote maintenance The chemical plants will need periodic maintenance, but all of the equipment will be highly radioactive. Expensive remote maintenance will be required. If graphite moderator is used, its replacement will also be remote and expensive. The main political barrier to MSRs is their perceived bomb-factory capabilities. If you talk to non-proliferation people, they will tell you that as soon as the (solid) fuel pins are cut open, a technology is considered proliferative. The problem with MSRs, then, is that the fuel is already completely cut open and melted. You’re halfway to a bomb already, they think. Here’s what they are worried about. Protactinium-233 decays to pure, weapons-grade U-233 — Many Thorium-cycle MSRs have to capture Pa as it is produced, removing it from the system while it decays to U-233 and then reinserting it into the reactor. They have to do this because otherwise the Pa-233 absorbs too many neutrons to maintain a breeding cycle. The problem here is that that ex-core U-233 is basically pure weapons-grade U-233 which could be used to make a bomb. It usually comes with Zr, but separating Pa from Zr is simple. Not many common reactors require such a proliferative step in their fuel cycle. Many MSR concepts do not do this, but LFTRs require it. Therefore, the owner of a LFTR could be producing bombs on the side. Many of the ideas for mitigating this problem (such as U-232 contamination and denaturing) only help against diversion by a nefarious third party. The owners of the plant could side-step these kinds of fixes easily, and that’s really what matters. Inventory tracking is difficult -- Because a lot of materials plate out in the reactor and in the chemical plant, it is difficult to keep exact track of all of your actinides. The IAEA puts safeguards in reactors to make sure that all the actinides are accounted for (to verify that no one’s making bombs on the side) but it will be difficult for the IAEA to distinguish plate-out losses from actual proliferative losses. Unknown waste form — It’s not clear what nuclear waste from MSRs will look like. The salt itself is not contained enough to be put in a repository so someone will have to come up with a stable waste form. Electrical heaters are required to stay liquid — in a prolonged power outage, the colder parts of the heat transfer loop might solidify. This could cause temperatures to rise over in the core (which will of course still be self-heated liquid). For MSRs to breed in a thermal spectrum, the lithium in the salt must be enriched to very pure Li-7. Li-6 is a strong neutron poison and becomes tritium, the pesky mobile radiation source. Also, Beryllium in Flibe is a controlled substance. It has some weapons applications and is a very dangerous material in terms of biological inhalation risks. In chloride salts, you must enrich to have pure Cl-37. Otherwise, Cl-35 has a strong (n,proton) threshold reaction that poisons the reactor. Also, the activation product Cl-36 is a long-lived, water soluble, hard beta emitter that complicates waste disposal. These enrichment needs increase the cost and complexity of MSR fuel cycles. Maybe we can find a more ideal salt someday. There are more specific problems with more specific types of MSRs, but you get the general idea here. Basically, MSRs are underdeveloped and require a lot more research (especially in corrosion) before they can surely take off as the world’s fleet of power plants. Personally, we think (as did Alvin Weinberg and Edward Teller) that these reactors have a shining place in the mid-future. Right now, we have to keep studying them! Fortunately, much work is ongoing. 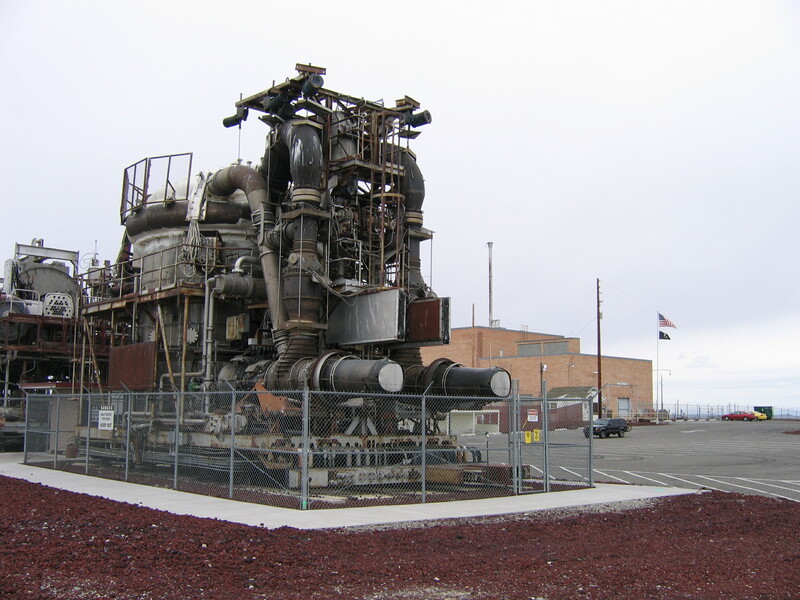 The first fluid fueled reactors were built during the Manhattan project. They were Aqueous Homogeneous Reactors (AHR), meaning they were solutions of uranium or plutonium in water. These small reactors were primarily used to study plutonium. Later (concurrently to MSR development), several AHR test reactors were built at Oak Ridge National Laboratory (these were the Homogeneous Reactor Experiments HRE-1 and HRE-2). Molten salt fuels were first conceived of in the late 1940s, when people began thinking of nuclear powered airplanes! The idea was to have very long range bombers in the air at all times. To heat air to high enough temperatures to provide thrust, such a nuclear reactor would need very high temperatures and very high power densities. The Aircraft Nuclear Propulsion program was a huge effort, and most of the early studies of molten salts were done under its direction. The first molten salt reactor, the Aircraft Reactor Experiment (ARE) operated in 1954 at ORNL with a Na-Zr-U salt for 100 hours. This reactor actually had fuel pumping through tubes in blocks of Beryllium. When inter-continental ballistic missiles came along, this program was promptly canceled. After the cancellation of the ANP project, the people at ORNL wanted to use their MSR skills to build a commercial power plant. 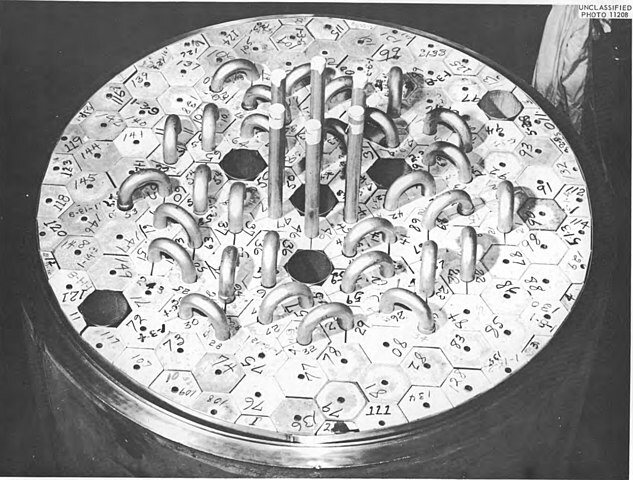 In 1956, ORNL director Alvin Weinberg hired a guy named MacPherson to form a group at ORNL to build such a thing. To be successful, they needed a fuel salt that absorbed very few neutrons, dissolved much uranium and thorium, was thermally stable, and was chemically compatible with structural materials. They decided the fluorides were best, but UF4 had a very high melting temperature (1035 C). Mixed with BeF2, the melting temperature became practical, but the viscosity was too high. Mixing in some LiF brought the viscosity down. Thus was born UF4-LiF-BeF2, now known as Flibe. Construction of a test reactor called the Molten Salt Reactor Experiment (MSRE) began in 1962 using this salt (with a bit of ZrF4), and the plant began operation in 1966. In 1968, all the uranium was extracted and replaced with U-233, the fissile nuclide of the Thorium cycle. Thus, MSRE was the first reactor to operate on U-233. The reactor was shut down on schedule in 1969 as funding was set to go towards designing and building a bigger prototype MSR called the Molten Salt Breeder Reactor (MSBR). But it would not be so! The Atomic Energy Commission (the ancestor of the Dept. of Energy) could not be convinced to put more money into the molten salt project. For one thing, they were already over budget on a very large and expensive fast-breeder project. Besides, there were some big problems at MSRE that some people were not convinced could be solved. ORNL director Alvin Weinberg put much energy into keeping the program going, but it was not destined to be. Funding was largely canceled and MSRs lost their momentum. MSR work continued at a low budget. The ORNL experts came up with likely solutions to most of the problems raised at the MSRE. When proliferation concerns about the MSR were brought up in the 1980s, ORNL developed (on paper) something called the denatured MSR, or DMSR that was not fissile self-sufficient, but still offered favorable performance in comparison to traditional reactors. Others throughout the world worked on salt chemistry problems and developed many other designs, including some chloride salt fast breeder MSRs. Much later, in 2001, the MSR was chosen by the Generation IV forum as one of the 6 Gen-IV concepts. This jump-started work on MSRs and engineers and chemists have produced much good work on them since then. The step-sister reactor of the MSR is the fluoride cooled high temperature reactor (FHR). These reactors have solid fuel in the form of TRISO particles (like the high temperature gas-cooled reactor), but rather than pumping high-pressure helium coolant through, they pump low-pressure liquid salt (usually Flibe) through. The idea here is to get the high-temperature and high-burnup benefits of the gas reactors without the risk of a depressurization accident. Salt coolant has incredible heat capacity (but low thermal conductivity), so it does a good job of handling accidents. These reactors are currently being studied by the DOE and many others (including the Chinese). Here is a PDF presentation by one of the PIs at MIT. There is ongoing work in MSRs around the world. The Europeans are working on MOSART, the Japanese have FUJI, the Americans are focused on the FHR. In 2011, the Chinese Academy of Science started a project in Shanghai to put substantial resources into MSR technology. There are 300-500 people on the project, with a budget in the hundreds of millions. Most of the work is on FHRs, but there is definitely MSR work as well. They are manufacturing Hastelloy-N, separating lithium, building salt loops, and building advanced modeling capabilities. That project is most likely the most exciting in MSRs since 1969. They plan on having both an experimental 2MW FHR and an experimental 2MW MSR operational by 2020. 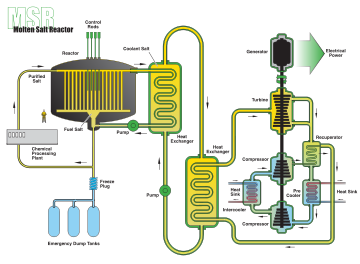 Several start-up companies have emerged to commercialize molten salt reactors. Hailing from MIT, Leslie Dewan and Mark Massie started Transatomic to build a MSR fueled largely by processed nuclear waste from traditional reactors. In Canada, Terrestrial Energy is working on small modular MSRs, featuring small reactor vessels that can be swapped out of a plant every 7 years or so. ThorCon is using its extensive experience in the ship-building industry to develop MSRs that need no new technology and can be built in the very near term. In Alabama, Kirk Sorensen himself runs a company called Flibe Energy targeting the development of small modular Thorium-MSRs. These companies represent the modern revival of interest in MSRs and we wish them all the best! Specific references coming soon. Almost all of this info was compiled from the incredible library of ORNL reports available online here. This stuff is pure gold.